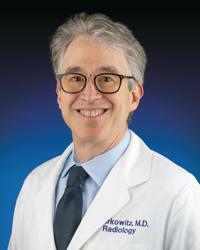 Dr. Berkowitz is an associate professor in the Department of Radiology and Chief of the Division of Neuroradiology. He specializes in CT and MRI of the brain, spine, and neck. He is experienced in non-invasive vascular imaging such as CT and MR angiography. He also performs interventional procedures such as myelography and epidural blood patch for cerebrospinal fluid leak. Dr. Berkowitz is an active researcher. Click here for a list of his publications.